Expose a std::list-like interface that owns and uses a custom LLVM-style allocator (e.g., BumpPtrAllocator), leveraging simple_ilist for the implementation details. Because this list owns the allocator, calling splice() with a different list isn't generally safe. As such, splice has been left out of the interface entirely. Definition at line 34 of file AllocatorList.h. Definition at line 135 of file AllocatorList.h. Definition at line 81 of file AllocatorList.h. Definition at line 82 of file AllocatorList.h. Definition at line 137 of file AllocatorList.h. Definition at line 84 of file AllocatorList.h. Definition at line 131 of file AllocatorList.h. Definition at line 79 of file AllocatorList.h. Definition at line 80 of file AllocatorList.h. Definition at line 133 of file AllocatorList.h. Definition at line 83 of file AllocatorList.h. 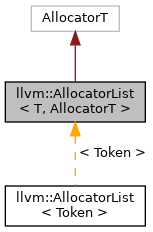 Definition at line 78 of file AllocatorList.h. Definition at line 140 of file AllocatorList.h. Definition at line 143 of file AllocatorList.h. Definition at line 159 of file AllocatorList.h. Definition at line 182 of file AllocatorList.h. Definition at line 184 of file AllocatorList.h. Definition at line 169 of file AllocatorList.h. Referenced by llvm::AllocatorList< Token >::emplace_front(), llvm::yaml::Scanner::peekNext(), and llvm::AllocatorList< Token >::push_front(). Definition at line 171 of file AllocatorList.h. Definition at line 213 of file AllocatorList.h. Referenced by llvm::AllocatorList< Token >::operator=(), llvm::yaml::Scanner::peekNext(), and llvm::AllocatorList< Token >::~AllocatorList(). Definition at line 187 of file AllocatorList.h. Referenced by llvm::AllocatorList< Token >::emplace_back(), and llvm::AllocatorList< Token >::emplace_front(). Definition at line 220 of file AllocatorList.h. Definition at line 223 of file AllocatorList.h. Definition at line 166 of file AllocatorList.h. Referenced by llvm::yaml::Scanner::getNext(), llvm::yaml::Scanner::peekNext(), and llvm::AllocatorList< Token >::resetAlloc(). Definition at line 170 of file AllocatorList.h. Referenced by llvm::AllocatorList< Token >::emplace_back(), and llvm::AllocatorList< Token >::push_back(). Definition at line 172 of file AllocatorList.h. Definition at line 204 of file AllocatorList.h. Definition at line 208 of file AllocatorList.h. Definition at line 183 of file AllocatorList.h. Definition at line 185 of file AllocatorList.h. Definition at line 191 of file AllocatorList.h. Referenced by is_ns_word_char(), llvm::AllocatorList< Token >::push_back(), and llvm::AllocatorList< Token >::push_front(). Definition at line 194 of file AllocatorList.h. Definition at line 199 of file AllocatorList.h. Definition at line 147 of file AllocatorList.h. Definition at line 154 of file AllocatorList.h. Definition at line 214 of file AllocatorList.h. Definition at line 215 of file AllocatorList.h. Definition at line 216 of file AllocatorList.h. Referenced by is_ns_word_char(), and llvm::yaml::Scanner::peekNext(). Definition at line 218 of file AllocatorList.h. Definition at line 217 of file AllocatorList.h. Definition at line 219 of file AllocatorList.h. Definition at line 173 of file AllocatorList.h. Definition at line 175 of file AllocatorList.h. Definition at line 174 of file AllocatorList.h. Definition at line 178 of file AllocatorList.h. Definition at line 230 of file AllocatorList.h. Definition at line 167 of file AllocatorList.h. Definition at line 161 of file AllocatorList.h.